Consumer Handbook of Solar Energy John H. Keyes Book Energy KSC What the homeowner or system designer needs to know to design and buy the right solar heating system, in spite of manufacturer sloppiness or misinformation. Natural Solar Architecture David Wright Book Green bldg Kl Co Passive solar homes and other buildings by David Wright, who helped pioneer passive solar architecture. Solar Energy Systems Design Harris et al. Book Energy KSC A technical tome covering passive and active solar heating systems, and solar electric generation. The Solar Home Book Bruce Anderson Book Grn bldg, Energy KSC Aspects of home solar energy, for the layman and consumer. Passive Solar Energy Book - Bruce Anderson and Malcolm Wells' classic work, in downloadable form. 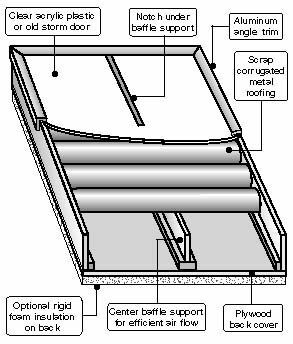 Plan for solar window heater has a good diagram, plus a few words to help the DIY-er figure out how to do it.